Who Are Your Streets Safe For? In past decades, cities have become more aware than ever of the potential dangers streets present. Despite ongoing effort to improve street safety, there are more fatalities than ever on local roads, especially for pedestrians. With the highest number of pedestrian deaths since 1990, America’s roads clearly need intervention. The reason is simple- cars are designed to help cars get where they need to go, with little or no regard for other street users such as pedestrians and cyclists. Techniques such as speed display signs to slow cars down, coupled with tools like bike lanes and narrower driving lanes that leave room for pedestrians, can transform an ordinary street into a complete one. The National Complete Streets Coalition launched the Safe Streets Academy to address street safety with more creative approaches that kept all users in mind. Three recent case studies released by the Coalition highlight how new approaches to safe streets can create more complete streets that address the needs of all users. In Orlando, FL, a five-lane speedway with a notorious record of crashes was transformed into a three-lane road with protected bike lanes and a mid-block crossing with a pedestrian refuge. In Lexington, KY, two dangerous intersections were redesigned by adding crosswalks and pedestrian refuges, both of which can be simply created with rubber curbing. People in the community who would be most affected by the project were invited to offer input in how to better design the streets. In South Bend, IN, traffic calming tools such as traffic circles, chicanes, and bump outs were used to encourage drivers to slow down while creating more vibrant places for other street users. Complete streets are doable, sometimes with just a few small changes to existing roadways. 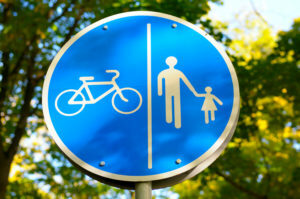 How are you making your streets safer for everyone? Is Your Safety Plan Driven by Data?